Hola Guys, Here I’m gonna tell you easy guide that how can you Increase App Storage Memory in MTK Chipset Android Phones. These days Android Operating System Phones are so much popular and Many of the users using Low Budget Phones because of lack of money. In Low Budget Phones, you will see that there is MTK Chipset in Low end Phones, So Obviously if you are using low-end, & low price phone then you will get Low Internal Memory in it & Lower app Storage. Also Have look on – How to Change Android Id. But if you want to Install More & more apps in you Android phone then you will see Space Running out Free up space. Fed up with Low app storage memory error, then feel free here is a solution for you. You can Increase Apps Storage Memory of your phone, Which is powered by MTK Chipset. Remember that this Guide will work only if you are using android phone which have MTK Processor. This Easy Guide Will work Perfectly without PC so just checkout How to Root Lenovo K3 Note running Marshmallow 6.0. MTK is a Company Nmae, Which is providing cheaper Processor for Android Phone. So That people can Enjoy Android phones at very low prices. MTK chipsets have a series like 6582, 6592 etc much more series are available. For more Information – All Mediatek Chipsets. Because in different phone you will see different MTK series. As you all know that Micromax providing most of the android phones, which are powered by MTK Chipsets. but there are also some company available who makes MTK chipset phones. but very few models are available like Samsung, Sony Companies. This Guide will format/ wipe all your data, so before follow this easy guide make sure you have backup your data. First of all you need Rooted Android Phone, if you are have a root permission then you can proceed to next steps. After that Install & Open HK Rom Editor app in your Phone, Which you was downloaded from above link. Then it will Ask you for Root Permission, Simply Click on Allow Button for Grant Root permission. It is necessary because this app will not work without rooting your phone. After that they will show you your Phone’s MTK Chipset Model name, just Click on it & it will open a new panel. Then it will show you all the memory information about your phone, How much storage is Available or not & some other System Values. then it will Start Processing your Request & it will take some moments to complete your request. Generally it will take only 4-5 minutes. Now Choose Reboot Recovery Button from the list. 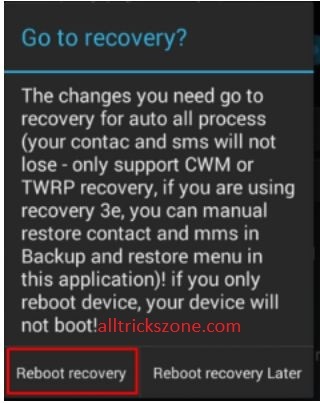 It will Reboot your phone into Recovery & wipe all data. So Guys, This was the Easy Guide for increase internal App Storage memory in Rooted MTK Android Phone. you can also Follow above Guide & enjoy more app storage memory in your phone. And Enjoy More Games in your Phone. Thanks for Visiting Stay tuned with us for more cool stuffs. ¿How to increase in mtk6580? Keep Enjoying and stay connected with us.